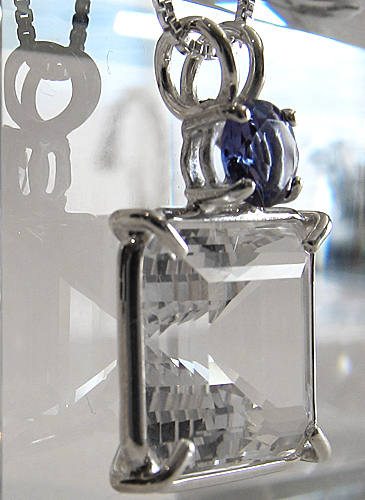 This unusual and beautiful new water-clear quartz pendant has been named Earth Heart Crystal because of its ability to create a "peaceful refuge in alignament with the deep and pure Heart of the Earth, revealing lessons in Oneness and facilitating humanity in achieving global consciousness." 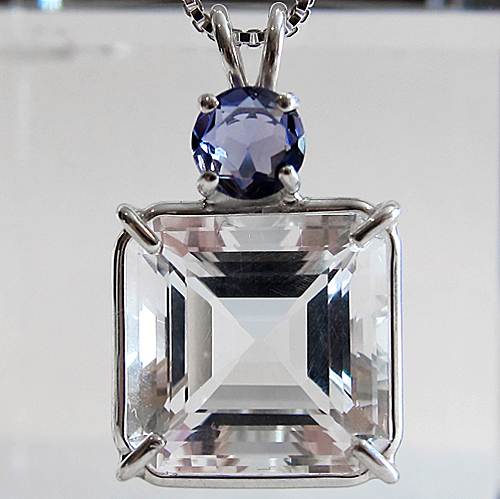 This beautiful pendant is crowned with a large round Iolite gemstone, and comes complete with its own sterling silver chain in a velvet jewelry box. When we first worked with this pendant, before the designers had come up with a name, I named it the Medicine Wheel because in working with it, I felt a strong connection to Native American traditions as well as a sense of deep protection, calm & access to my own Higher Wisdom, as well as being connected to a long line of Wisdom Keepers. Note: Weight above is shipping weight. Actual weight of this pendant is .20 oz.